Women’s Ice Hockey Can’t Find Consistency, Moves to 8-7-1 after Splitting Pair with Conn. Playing number three, David Kerr ’14 earned one of the Jeffs’ two victories in a 7-2 loss to Brown. As the start of the new semester begins, the men’s and women’s squash teams head into the final stretches of what have been equally dramatic and unexpected seasons. The men, battling injuries all season, currently sit at 7-11 while the women, led by five first-year players, own an impressive 10-6 record and sit at 16th in the country — their highest position in recent Amherst squash history. The men’s season has been highlighted by a 9-0 win against Hamilton and positivity amidst injuries to key players. Still, the NESCAC has proven especially strong this year, as Wesleyan has defeated the Jeffs twice and the College has also fallen to Bates, Bowdoin, Middlebury and Williams. Captain Nick Sorrentino ’13 said that a key strength for the Jeffs has been the play of their first-year players, especially Bermuda-native Noah Browne. The men’s most exciting match of interterm came in a 5-4 victory over Connecticut College. With the match tied at 4-4, Jake ‘Bulldog’ Albert ’15 was the last match on. He was able to pull out a tight five-gamer (11-9 in the fifth) to give himself and the team the victory. Scott DeSantis ’15 was hopeful the team’s play would improve heading into the NESCAC playoffs. He forsees a rematch with Wesleyan. The women’s squash team, meanwhile, has enjoyed one of their best seasons to date. After losing five seniors to graduation last year, this was largely expected to be a down year for the Lady Jeffs. That has been anything but the case as the women enter NESCACs ranked no. 16 in the country. “Overall, we have been having a great season so far, and this is probably the strongest team we have had since I’ve been at Amherst”, captain Mary Katherine McNeill’ 13 said. The team is currently ranked no. 4 in the NESCAC, having lost only to Middlebury, Bates and Williams in conference play. The highlights of the season for the women’s team include a 7-2 victory over Bowdoin and a pair of wins against Wesleyan. Of note, first-year Taryn Clary ’16 has had a nearly undefeated season in NESCAC play and is a potential contender for NESCAC Rookie of the Year. “With NESCAC’s this weekend and Nationals in only two weeks, we’re hoping to continue to move up in the rankings, which we definitely are very capable of doing,” McNeill said. The captain also lauded the play of co-captain Anne Piper ’13, who missed all of last season with an injury but come back to fill the no. 2 spot on the team in an impressive fashion. 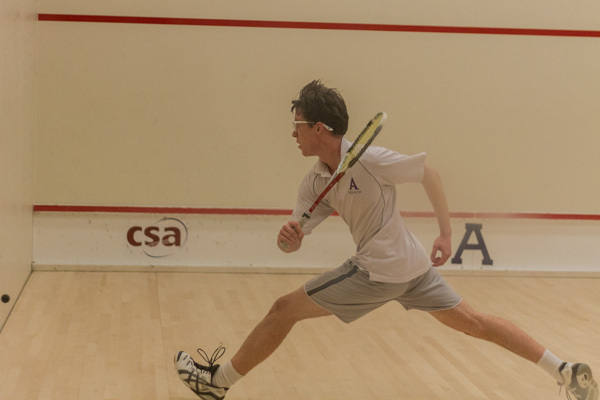 It will certainly be exciting to keep an eye on the men’s and women’s squash teams in NESCAC and Nationals play to see if they can continue and build upon their strong forms.